Tadakuni is a second-year high school student of the Prefectural Sanada North High School and a member of its Handicrafts Club. He is in Class 2-A. Tadakuni is the main trio’s only sane man and the one who usually opposes Hidenori and Yoshitake’s crazy ideas with vehement disapprovals, primarily because they always hang out at his house. Despite this fact, he constantly gets involved in their antics. Tadakuni is also shown to be very ditzy. He isn’t in good terms with his little sister and rarely talks to her. He works part-time at a pizzeria with Nago-san and Yasunori. He has known Yoshitake since elementary school and Hidenori since middle school. 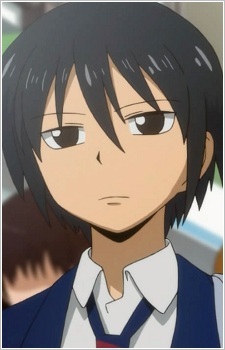 In the final chapter of the manga, when Hidenori confronted Yoshitake regarding Rubber Shooter’s identity, it was revealed that Tadakuni was Rubber Shooter along with Yoshitake and three—or four—other kids.